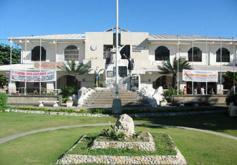 Talisay is a component city of the Province of Cebu in Central Visayas and forms part of the Metropolitan Cebu area. Located in the modern central quadrant of the province, it is bounded on the north by Cebu City, on the south by the Municipality of Minglanilla, on the west by Toledo City and on the east by Bohol Strait. It serves as an intermediary to the south of Metro Cebu and gateway to southern and western towns of the province. The City of Talisay has a total land area of 4,370 hectares and has 22 barangays which are all considered urban. Its climate is characterized by a definIte dry season from November to May and a rainy season from June to October. Physically, the city consists of diverse landmass of varying terrain. The City of Talisay registered a total population of 148,110 in 2000 recorded in NSO Census of Publication book with an average population growth of 4.25 percent. However, a special census conducted by National Statistics Office sometime in May 2000, specifically for the application of the then Municipality of Talisay for Cityhood yielded a population of 150,238 based on the number of residents working & studying in schools in other component cities, and residential subdivisions of the city. For the purpose of planning and drafting the CLUP 2001-2010, however, and considering the availability of socio-economic data, the NSO Population 2000 was used as basis. There were a total of 28,751 households in 2000 and the population density was recorded at 36.23 persons/hectare. It is projected that the city's total population will reach 224,587 by 2010. The famous Mananga River that cuts and wind its way through the slopes and valleys of the mountains that overlooked the eastern and western coast of the island. The Mananga Phase 1 Project produces 13.6 million cubic meter of water to Metro Cebu. Its sands and gravel identified as class A for all sorts of construction application. A God’s gift to all Talisaynons. As the previous City Mayor, Hon. Eduardo R. Gullas has already initiated the creation of the City College, the present administration anticipates for a construction of a new building to accommodate the increasing number of students. This gives all deserving students who lack financial means a chance for an alternative quality education. Through this program, our less fortunate constituents can now expect a brighter future for their children. There are a total of 822 commercial establishments in the City of Talisay. Some of these establishments are branches of big commercial companies operating in the country. Gaisano Fiesta Mall in Barangay Tabunoc serves as the biggest shopping center in the City. There are manufacturing activities in the City which include woodcraft (wooden furniture and fixtures), cutlery metal craft, ceramics and crushing plants. Cottage industries in the City include rattan craft, fish processing, native handicrafts, fashion accessories, garment manufacturing and stone craft. A city that promotes sustainable utilization of its natural resources. Improve existing infrastructure and other support facilities to encourage employment opportunities and economic activities.